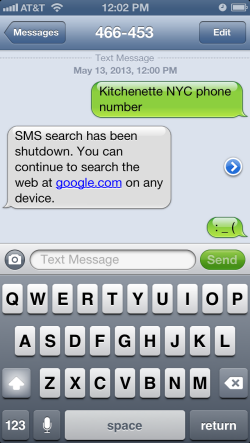 Google SMS search shutdown angers people who had forgotten it existed. Here’s another one for the Google Graveyard. Users of Google’s once-popular SMS search function found last week that texting search queries to 466453—“GOOGLE” on alphanumeric keypads—no longer works. Instead of texting back search results, Google responds with a short message noting that the service “has been shutdown” (sic) and that you can continue to search the Web by visiting google.com (duh). Meanwhile, the Web page that used to explain how SMS search works appears to have been taken down entirely. For the majority of Americans who own smartphones, this would seem unlikely to come as a major blow. That hasn’t stopped people from griping about the move on Google product forums, though. The annoyance from folks who still have feature phones without data plans is understandable, given that Google apparently gave no advance warning. But the legitimate frustrations seem to be mixing with generalized ill will toward Mountain View from people who haven’t used SMS search in years, if they ever did. I remember SMS search as a pretty handy trick on my old flip-phone. It offered a way to quickly and easily look up directions, phone numbers, or the score of a game on a phone that either couldn’t browse the Web or took forever to load a page. Still, it’s hard to blame Google for shutting it down. It basically provided the service as a public good, and now that most of the public no longer needs it, it makes sense for Google to stop paying for it. Instead of blasting Google for discontinuing SMS search, let’s take a second to appreciate the fact that it continued providing it long after most of us had forgotten it existed.